By LISA DRAYER IS A NUTRITIONIST, AN AUTHOR AND A CNN HEALTH AND NUTRITION CONTRIBUTOR. 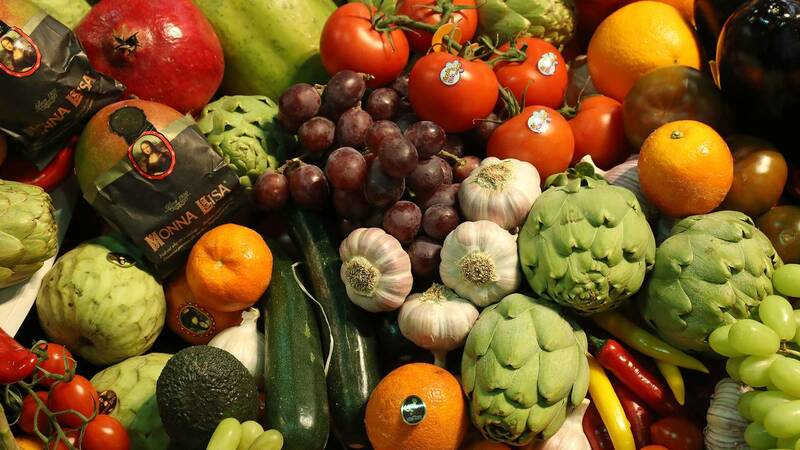 Fresh fruits and vegetables lie on display at a Spanish producer's stand at the Fruit Logistica agricultural trade fair on Feb. 8, 2017, in Berlin, Germany. (CNN) - You may be aware that a plant-based diet can make you healthier by lowering your risk for obesity, heart disease and Type 2 diabetes. But research shows there's another good reason to regularly eat meatless meals. By filling your plate with plant foods instead of animal foods, you can help save the planet. One study, published in October in the journal Nature, found that as a result of population growth and the continued consumption of Western diets high in red meats and processed foods, the environmental pressures of the food system could increase by up to 90% by 2050, "exceeding key planetary boundaries that define a safe operating space for humanity beyond which Earth's vital ecosystems could become unstable," according to study author Marco Springmann of the Oxford Martin Programme on the Future of Food at the University of Oxford. "It could lead to dangerous levels of climate change with higher occurrences of extreme weather events, affect the regulatory function of forest ecosystems and biodiversity ... and pollute water bodies such that it would lead to more oxygen-depleted dead zones in oceans," Springmann said. "If the whole world, which continues to grow, eats more like us, the impacts are staggering, and the planet simply can't withstand it," said Sharon Palmer, a registered dietitian nutritionist and plant-based food and sustainability expert in Los Angeles who was not involved in the new research. Sustaining a healthier planet will require halving the amount of food loss and waste, and improving farming practices and technologies. But it will also require a shift toward more plant-based diets, according to Springmann. As Palmer noted, "research consistently shows that drastically reducing animal food intake and mostly eating plant foods is one of the most powerful things you can do to reduce your impact on the planet over your lifetime, in terms of energy required, land used, greenhouse gas emissions, water used and pollutants produced." It might come as a surprise, but Springmann's study found that the production of animal products generates the majority of food-related greenhouse-gas emissions -- specifically, up to 78% of total agricultural emissions. This, he explained, is due to manure-related emissions, to their "low feed-conversion efficiencies" (meaning cows and other animals are not efficient in converting what they eat into body weight) and to enteric fermentation in ruminants, a process that takes place in a cow's stomach when it digests food that leads to methane emissions. The feed-related impacts of animal products also contribute to freshwater use and pressures on cropland, as well as nitrogen and phosphorus application, which over time could lead to dead zones in oceans, low-oxygen areas where few organisms can survive, according to Springmann. For an example of how animal foods compare with plant-based foods in terms of environmental effects, consider that "beef is more than 100 times as emissions-intensive as legumes," Springmann said. "This is because a cow needs, on average, 10 kilograms of feed, often from grains, to grow 1 kilogram of body weight, and that feed will have required water, land and fertilizer inputs to grow." In addition, cows emit the potent greenhouse gas methane during digestion, which makes cows and other ruminants such as sheep especially high-emitting. Other animal foods have lower impacts because they don't produce methane in their stomachs and require less feed than cows, Springmann explained. For example, cows emit about 10 times more greenhouse gases per kilogram of meat than pigs and chickens, which themselves emit about 10 times more than legumes. Like animals, plants also require inputs from the environment in order to grow, but the magnitude is significantly less, Springmann explained. "In today's agricultural system, we grow plants to feed animals, which require all of those resources and inputs: land, water, fossil fuels, pesticides, herbicides and fertilizer to grow. And then we feed plants to animals and care for them over their lifetime, while they produce methane and manure," Palmer said. Adopting more plant-based diets for ourselves could reduce the greenhouse gas emissions of the food system by more than half, according to the Nature study. A mainly plant-based diet could also reduce other environmental impacts, such as those from fertilizers, and save up to quarter use of both farmland and fresh water, according to Springmann. Palmer explained that "legumes [or pulses], such as beans, lentils and peas are the most sustainable protein source on the planet. They require very small amounts of water to grow, they can grow in harsh, dry climates, they grow in poor nations, providing food security, and they act like a natural fertilizer, capturing nitrogen from the air and fixing it in the soil. Thus, there is less need for synthetic fertilizers. These are the types of protein sources we need to rely upon more often." Experts agree that if you are not ready to give up meat entirely, a flexitarian diet, which is predominantly plant-based, can help. This diet includes plenty of fruits, vegetables and plant-based protein sources including legumes, soybeans and nuts, along with modest amounts of poultry, fish, milk and eggs, and small amounts of red meat. Vegetarian and vegan diets would result in even lower greenhouse gas emissions, but a flexitarian diet "is the least stringent that is both healthy and would reduce greenhouse gas emissions enough for us to stay within environmental limits," according to Springmann. Palmer said that "although vegan diets, followed by vegetarian diets, are linked with the lowest environmental impacts, not everyone is interested in taking on those lifestyles. But everyone can eat more of a flexitarian diet. It doesn't mean that you have to give up meat completely, but you significantly reduce your intake of it." Registered dietitian nutritionist Dawn Jackson Blatner described it this way: "A flexitarian is really someone who wakes up with the intention of being more vegetarian. It's different from vegetarian in that there is some flexibility." Just how "flexitarian" you wish to be can be flexible, too. For example, Blatner, who was not involved in the Nature study, offers three levels of the diet in her book "The Flexitarian Diet": a "beginner" flexitarian, who consumes six to eight meatless meals per week (or is limited to 26 ounces of animal protein); an "advanced" flexitarian, who eats nine to 14 meatless meals per week (or is limited to 18 ounces of animal protein); and an "expert" flexitarian, who eats at least 15 meatless meals or limits animal protein to 9 ounces per week. The key is not just eliminating meat but swapping in plant-based proteins, including beans and lentils. A Mediterranean meal might incorporate chickpeas; a Mexican meal might have black beans or pintos; an Asian meal might include edamame; an Italian meal might use white beans or lentils to make a "Bolognese" pasta sauce, Blatner explained. "I wrote the book because I really wanted to be a vegetarian, but I just couldn't do it so strictly," she said. "I really wanted to lean in to a more plant-based diet, but I needed a little more flexibility. So it's the great compromise." To get started on a flexitarian diet, here's a sample three-day plan, courtesy of Blatner. You'll notice that some meals have a choice of a plant-based protein or an animal-based protein. Choose plant as often as you can, and you'll soon be an expert-level flexitarian of 15-plus meatless meals per week.